My apologies for the delay! Today, let's talk about decorating for the holidays. What traditions do you have? Is there a light show you go to see? Is there that one neighbor who puts up enough lights that their house can be seen from space? Let's talk about it. For your story, you'll get three random cards, and take one choice character card numbered 05! The Bonnes are the best air pirates in the world! They're out looking for treasure, and nobody is going to stop them! There's just a slight problem, though. Their main ship, the Gesellschaft, just threw up an error message. They'll have to take a journey to find what they need to fix the ship. Today, they're going to Tokyo, specifically the Azabu Juban district. A girl with buns and long pigtails has a special item that was once a treasure of a...civilization on the moon? And she uses it to take out really strong enemies? With that, they won't need to fuel up for years! If you can name the item, its owner, and the series it's from, you'll get six random cards - two cards for each correct answer. This round will end October 25! 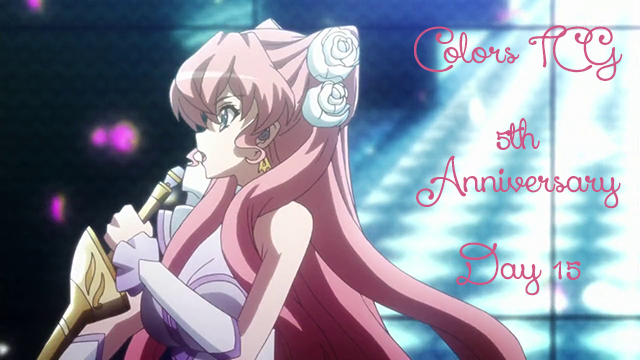 Welcome to the Colors Beauty Pageant~★! Please join Mizuki, Mikuru, and I as we set out to find things that are fresh, new, and lovely~★! This round, our theme will be music and musical instruments! ▪ REQUIRED: The character you turn in must be singing or playing an instrument. ▪ Bonus: The character is wearing a costume. ▪ Bonus: They're accompanied by their friends. Main Theme: Four random cards total. Main Theme + One Bonus Theme: Six random cards total. 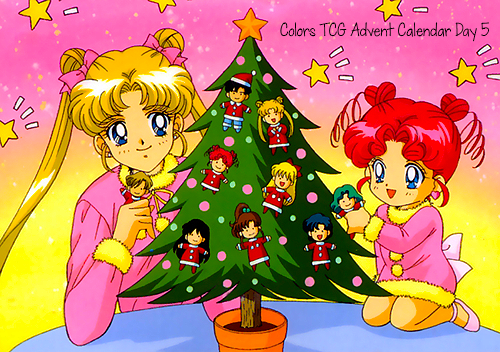 Main Theme + Two Bonus Themes: Six random cards and one crayon! Additional Note: You are allowed to submit one image that fulfills the requirements. If you need any clarification, please post to the Questions thread, but please only submit one image! This round will end on October 30! Have fun, and enjoy the pageant~★! Today, we're saying goodbye to Kio, Asemu, and their friends. It's time to go to a world called Terra, and an island called Kattelox. Today, they're looking underground in Kattelox Island. They need a big treasure to power up the engine. I've heard it's a yellow-colored crystal. If you can name the exact name of the object in question, you'll get three random cards! To celebrate the change of host, you can also take a choice character card beginning with the letter B. This round will end on October 18! 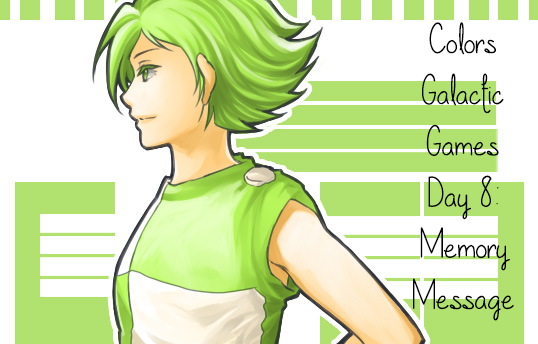 Midori~n has a message for all of you, but you're going to have to play a game to find out what it is. The game itself is going to be short, sweet, and simple: matching cards. The way it works is that you're going to go here and play the game, then come back to this post and give me the message that pops up when you win. Please be sure to include your team name, because I can't award points if you don't include it. Banner art is by Nuge, and card art is by Moon! One rainy, gloomy day Kio was bored and looking for ways to pass the time so he went looking through the house and eventually found an old scrapbook he'd never seen before. Kio's curiosity was awoken and he opened it, only to find pictures. Pictures after pictures of Asemu and his friends back in high school and their mechanics lab... and all their guests and clients over the years. This is a chronicle of those times. This round, our theme will be kimono and yukata! ▪ REQUIRED: The character you turn in must be wearing a kimono or a yukata. ▪ Bonus: The character is at a festival. ▪ Bonus: There are fireworks in the background. This round will end on July 17! Have fun, and enjoy the pageant~★! I apologize for the delay here! Today, we're going to talk about music. What's your favorite song from a game or anime series? Is there a particular composer you really love? What song would you like to hear remixed? Let's talk about those. For participating, you'll get fivetastic15, two random new release cards, and a random crayon. As an apology for my being late, you can also take a character choice card numbered 15. Like the other anniversary posts, this game will close on July 1st at noon GMT! 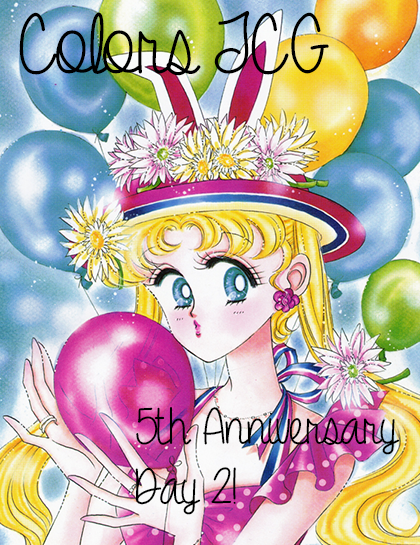 Colors TCG 5th Anniversary - Day 02! Hello, everyone! I hope you're enjoying things so far. Today, let's play a game. The way this will work is that I've taken the names of some Colors Universe characters, some TCG services, and some games, and I've made anagrams of them. For each one, I'll give you the number of words and a clue. The more anagrams you untangle, the more rewards you'll get! 0-1 words: the fivetastic02 card! 2-3 words: fivetastic02 and two random cards! 4-5 words: fivetastic02, two random cards, and a random crayon! 6-7 words: fivetastic02, two random cards, one character choice card, and a random crayon! 8-10 words: fivetastic02, two random cards, one character choice card, and two random crayons! I will ask you for your choice card when I give out prizes. The answers to all the words can be found in colors_tcg and the website. Please be sure to link your reward collecting thread in your reply. This game will close with the other Anniversary events, on July 1st, at noon GMT! This round, our theme will be a wild card round - time to show me your favorite characters! ▪ REQUIRED: The character you turn in must be a favorite of yours. ▪ Bonus: Tell me why they're your favorite. ▪ Bonus: Put a smiley face or emote in your reply. One more note: I'll be moving in June, hence the wild card round. I may be a little late awarding prizes because of this, and I apologize in advance. This round will end on June 12! Have fun, and enjoy the pageant~★! If you can name the item and the series it's from, you'll get three random cards! If you can name the owner of this item, I'll add a random May release card! This round will end on May 31! If you can name the item and the series it's from, you'll get three random cards! This round will end on May 24! Welcome to the Colors Beauty Pageant~★! Please join Mizuki, Mikuru, and I as we set out to find things that are fresh, new, and lovely~★! AFTER RL KICKING ME IN THE TEETH, MY APOLOGIES. This round, our theme will be brightly colored hair. ▪ REQUIRED: The character you turn in must have brightly colored hair - show us your blue, your green, your pink, etc. ▪ Bonus: The character has a school uniform on. ▪ Bonus: The character is outside. This round will end on May 29! Have fun, and enjoy the pageant~★! Congratulations to the winners of last round! You're free! Leave your despair behind you now, okay? It's time to smile, to cheer, to be happy! The object of the Pot of Gold is to complete different "tasks" that will be different every month. You'll get small rewards for completing them individually, but receive bonuses if you manage to complete all of them. How much of the rainbow can you complete? You have until May 1st at 12:01AM in the latest time zone in the world to complete these tasks. Good luck! This round will end on April 5! Also, my apologies for leaving out the picture last round. I'll be giving an extra card for last round and this round to make up for it. If you can name the person and the series she's from, you'll get three random cards! This round, our theme will be ROYALTY. ▪ REQUIRED: The character you turn in must be royalty - a king, queen, prince, princess, you get the drill. Dukes, duchesses, lords and ladies will also count. ▪ Bonus: The character has a fancy dress/outfit on. ▪ Bonus: The character is holding some kind of flower, or there are flowers in the background. This round will end on February 21! Have fun, and enjoy the pageant~★! 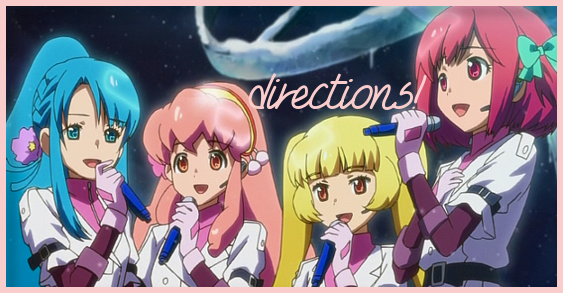 AKB0048 is the idol group that will travel through space to see you! They've just gotten the directions to their next show. Where are they going this time? If you can tell me the name of this place and the game series it appears in, you'll get three random cards. Last time, they were in Ohtori Academy from Revolutionary Girl Utena! This round will end February 10! Last time the answer was the Twilight Bracelet from .hack! I was looking for Data Drain as the answer, but gave credit for Gate Hacking too. If you can name the player and the team he's on, you'll get three random cards! 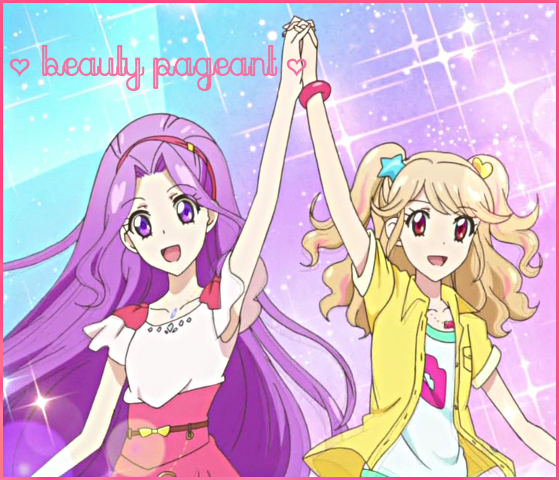 Welcome to the Colors Beauty Pageant~★! It's been a while, hasn't it? We're back now, though. Please join Mizuki, Mikuru, and I as we set out to find things that are fresh, new, and lovely~★! This round, our theme will be PARTNERS. ▪ REQUIRED: The characters you turn in must be partners. For example, you could turn in a picture of Double M, since Mizuki and Mikuru are partners. To make it easier, I'll consider characters like Ed and Alphonse Elric from FMA, too. Pokemon and Digimon count, so you could turn in Ash and Pikachu or Mimi and Palmon. ▪ Bonus: The characters have matching outfits! ▪ Bonus: At least one character has brightly colored hair! ▪ Bonus: One character is taller than the other! Main Theme + Three Bonus Themes: Six random cards and two crayons! This round will end on February 6! Have fun, and enjoy the pageant~★!